Users who encounter Locket Ransomware should be relieved to know the malware is just pretending to be capable of destroying their files. In reality, the program does nothing more besides locking the user’s screen and displaying a particular message. According to our researchers through it, the cyber criminals behind the malicious application, ask users to pay a ransom of 50 US dollars in exchange for guaranteed “PC recovery.” Needless to say, since your files should not be erased and they did not get encrypted, paying the ransom could be a complete waste of your money. Thus, what we advise instead is unlocking the screen and removing Locket Ransomware at once. We realize this might be a difficult task for some users which is why we are placing deletion instructions at the end of this text. The malicious application could sneak in after launching a malicious setup file, an unreliable email attachment, a fake software update, and so on. If the ransomware application was able to encrypt user’s data, it would first do so and only then display a ransom note. 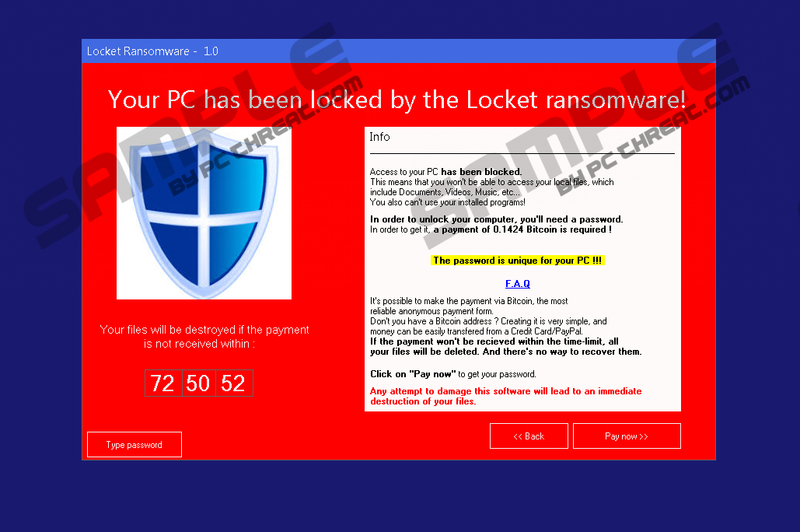 However, since Locket Ransomware is a bit different from other ransomware threats and does not have such an ability, it might lock the screen and display the message right after its launch. Because of this, we always recommend scanning data received from not the most reliable sources with a trustworthy antimalware tool. Then, if the tool does not find any malicious components you could try to open the scanned data; otherwise, it should be eliminated at once. As explained earlier, Locket Ransomware locks the screen by placing a full-screen window with a message or a ransom note on it. To be more precise, what the malware’s victims should see is a red window called Locket Ransomware – 1.0” with a picture of a Microsoft Shield logo, a countdown clock, particular instructions, a few buttons, and so on. The instructions only say the user is supposed to pay 0.1424 Bitcoins or 50 US dollars to a given Bitcoin wallet. The rest of the information is available if the user clicks a link called “Payment instructions.” As for the clock, it is apparently counting down till the last second when the user still has the chance to make the payment and save his data from being destroyed. Our researchers say this should not happen, but in any case, there is no point in waiting till the time runs out, you should erase the malware immediately. To be able to delete the threat the user must first unlock his screen. We have learned it can be done in two ways. For starters users could try submitting a code we discovered after testing Locket Ransomware; it is ul62bfqSA. It should be typed after clicking a button called “Type password.” If this does not work or you just want a simpler way to unlock the screen you could try to restart your computer instead. The malicious application does not have the ability to relaunch itself together with the operating system, so even if the restart does not remove the malware; the screen should not be locked again. Naturally, without being able to access the Start menu, users may have to restart the computer by holding its power button to shut it down and then clicking it again to turn it back on. Once you gain the control of your PC again, you could finally remove it. Fortunately, there are two ways to get rid of Locket Ransomware as well. One of it is to find the suspicious file launched before the computer got infected and erase it. If you have no idea where it might be or how to delete it, you could follow the instructions we added at the end of this article. The second option is to acquire a trustworthy antimalware tool and scan your system with it. The tool should detect the malicious application together with other possible threats, and the user should be able to eliminate the detections at the same time with just a single mouse click. Find a malicious file you could have opened before the screen got locked. Quick & tested solution for Locket Ransomware removal.